Wirecloud is a web mashup tool designed to ease the development of operational dashboards. This allows end users to easily create web applications and dashboards without programming skills and to visualize data of interest and control their environment. Recording of the Workshop about WireCloud delivered in the Developers' week at Madrid. This video presents an introduction on WireCloud and also presents some practical examples of how to use it for Data/Application Visualization and for building custom dashboards. 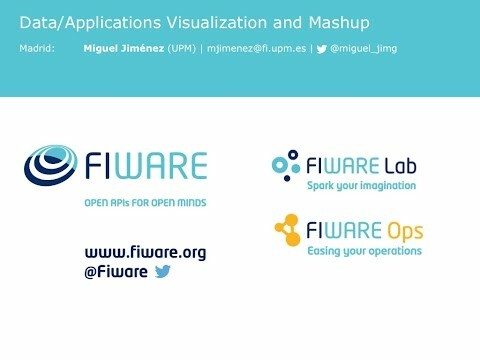 Recording of the IMDEA FI-PPP Liaison Workshop about WireCloud. This video presents an introduction on WireCloud and also presents some practical examples of developing a simple chat widget using the WireCloud APIs. This presentation introduces the WireCloud framework, its architecture and APIs. In this section you will learn how to use WireCloud from the point of view of a end user. That is, you will learn how to create and manage dashboards using WireCloud. In this section you will learn how to use WireCloud from the point of view of a component developer. That is, you will learn how to develop Mashable Application Components (widgets and operators). Lesson 3.1.0 - Quick start Quick tutorial on how to develop widgets using FIWARE technology. Lesson 3.1.1 - Creating widgets and operator descriptions This presentation explains how to create widget and operators descriptions using either XML or RDF. Lesson 3.1.2 - Logging error messages This presentation shows how to log error messages from widgets and operators. Lesson 3.1.3 - Making requests and wiring These slides show an example to learn how to use the most commonly used features of WireCloud. Lesson 3.1.4 - Adding preferences This presentation explains how to add preferences to config.xml file. Lesson 3.1.5 - Accessing context information These slides show how to discover the available context information of a WireCloud instance and how to use widget context for resizing widget's content. Lesson 3.1.7 - Dynamic dashboards These slides explain how to create dynamic dashboards by the use of the Dashboard Management API. Lesson 3.1.8 - Accessing third-party services using IdM tokens These slides explain how to use IdM tokens associated with the users for accessing third-party services from WireCloud widgets and operators. Lesson 3.2.2 - Using Object Storage This presentation explains how to configure and use the Object Storage. Lesson 3.4 - Developer exercises - Some WireCloud exercises targeting widget and operator developers. In this section you will learn how to use WireCloud from the point of view of an administrator. That is, you will learn how to install and administrate your WireCloud instances. Lesson 4.2 - Translating WireCloud - This tutorial describes the needed steps to customize the language of your WireCloud instance.